The Lambeth Hate Crime Forum was re-launched on the Thursday 24th January 2014. The forum brings together key people and organisations from across Lambeth Council, Lambeth Police and representatives from our local communities covering the five major hate crime strands; disability, faith, gender identity, race and sexuality. The meetings take place every four months; November, July and March. Lambeth is divided into three geographical areas; North, Central and South. So the March meeting will focus on issues in the North of the borough, the July Meeting will focus on issues in the Centre of the borough and the November meeting will focus on issues in the South of the borough. The meetings are three hours long and usually take place between 2pm to 5pm, which over the course of a year is a total of nine hours. Allowing approximately one hour for admin purposes, one hour for the Hate Crime Prevention Coordintaor’s reports, one hour for partners reports, one hour per hate crime strand, and one hour for any other business. 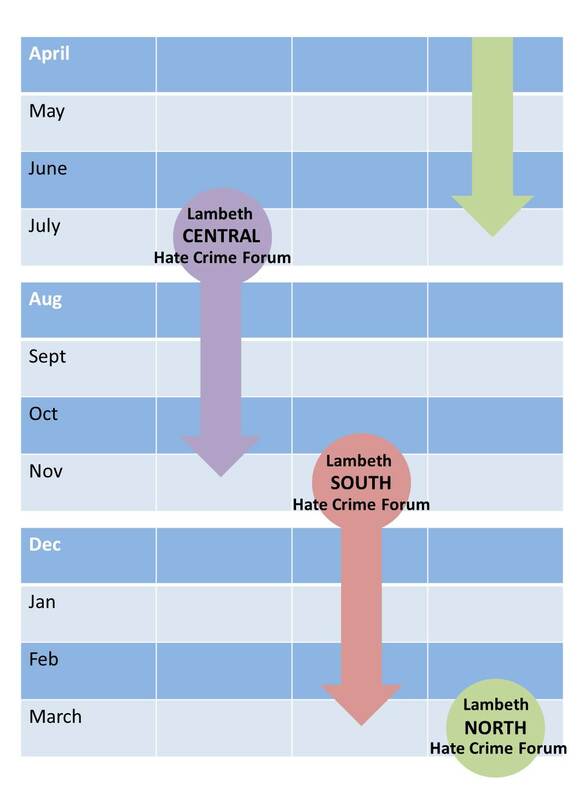 The Lambeth Hate Crime Forum is provides us with the stratgeic overview of what is being done to tackle hate crime in Lambeth, whilst the Hate Crime Working Groups look at the specific work within the hate crime strands in much greater detail. For more information contact Mark Healey. After the meetings take place, the minutes are written up, the first draft minutes V0.1 are circulated for corrections and amendments by those who attended the meeting. Once corrected the corrected minutes V0.2 are then circulated to all members of the Lambeth Hate Crime Forum. The corrected minutes are then put forward to be approved at the next meeting where they then become V0.3. This working group has already evolved into the Disability Hate Crime Partnership Lambeth. More information is available here. Has met a couple of times and is in the process of establishing itself. More information here. Has been combined with the Sexual Orientation Hate Crime Working Group. See below. Is still in the process of being established. More information will eventually be posted here. This working group has started to evolve into the Lambeth LGBT+ Community Network. More information is available here. Has not been set up. Has been established and meets quarterly. Contact Paul Dunn at Lambeth Community Safety Service for further information.